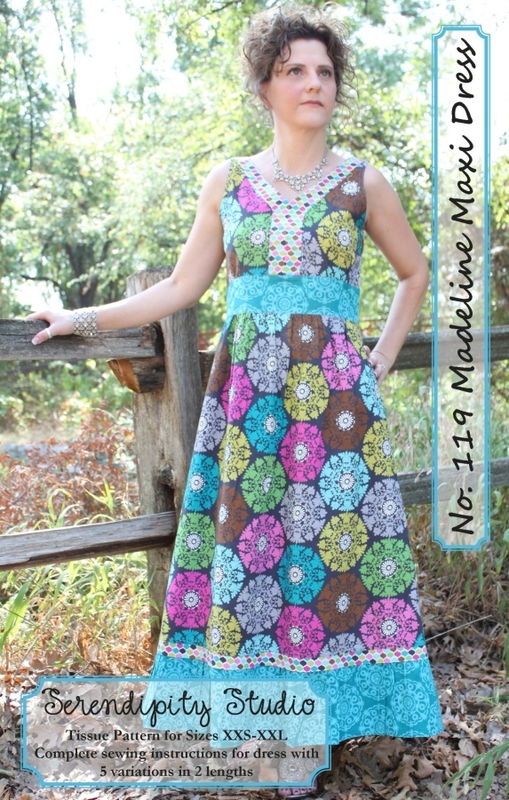 The fourth pattern from Serendipity Studio called the Madeline Maxi Dress was my least favorite in the store because of the model pictured on the front (my apologies to the model). 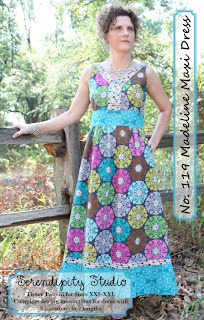 This dress looks like a quilt that should be thrown over the back of a couch in a farmhouse! When I opened the pattern, the pictures of other finished dresses were better, but I wasn't convinced this would turn out to be something I’d actually get to wear. One of the best parts of sewing is getting to design your own masterpiece by putting together gorgeous fabrics. 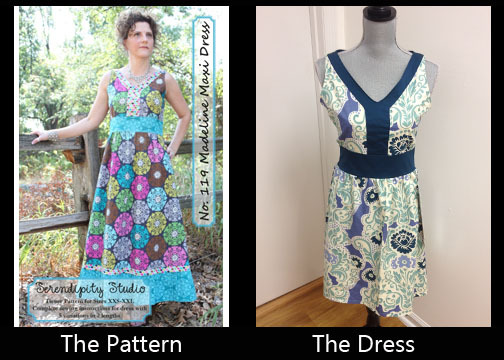 I chose one of my favorite fabrics to make the dress, but decided to use a solid color for the contrast pieces so it wouldn’t look as busy as the dress pictured. I also decided on the knee length version. This is how it turned out. I adore it, and it fits perfectly! I should be wearing if for you since the dress doesn't fit the dress form well, but I finished this dress after a 30 mile bike ride so there was no way I was going to be photographed! I am very surprised at how well this turned out. 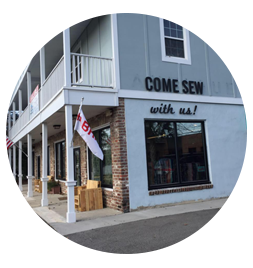 This goes to show how beautiful fabrics can really change the look of a garment. In regard to the directions in the pattern, there are lots of steps which may seem daunting to the beginner sewer, but if you choose to make the dress out of only two fabrics in the basic style like I did, you end up skipping many of the steps such as adding contrast to the waistband and making ruffle trim. There is a list of very important general instructions given at the start of the pattern which I recommend to read carefully. I found the tips on sizing in this section to be especially important. The bust measurement is the most critical in choosing the fit for this pattern, then the waist. It is easy to make this dress smaller in the waist if needed which is what I had to do once the dress was completed. I recommend this pattern to the advanced beginner (if you know how to put in an invisible zipper) or it would be a great project for the new sewer who has guidance. The only part I found difficult was making sure the back contrast waist bands were even on both sides of the zipper. After the first zipper installation, one band was slightly lower than the other, and I really am not sure what caused this to occur, so I had to take the zipper out and start over. I really think this turned out well, and I am glad I took a chance on the pattern. This fourth pattern has confirmed for me that you really can't judge a pattern by its cover!